Tonight, Carsten Nicolai and his brother Olaf will be performing a DJ set following a special presentation of the works of Alicia Frankovich. For more details, email adelayawitz@gmail.com. Across the artificial divide separating the worlds of music and art, Carsten Nicolai, aka Alva Noto, is known for an aesthetics of precision: the form of the artist’s stripped-down sound and design installations often follows a scientific function, playing with and altering viewers’ audio-visual perceptions—from the documenta in Kassel and the Venice Biennale to the Guggenheim and Tate Modern. 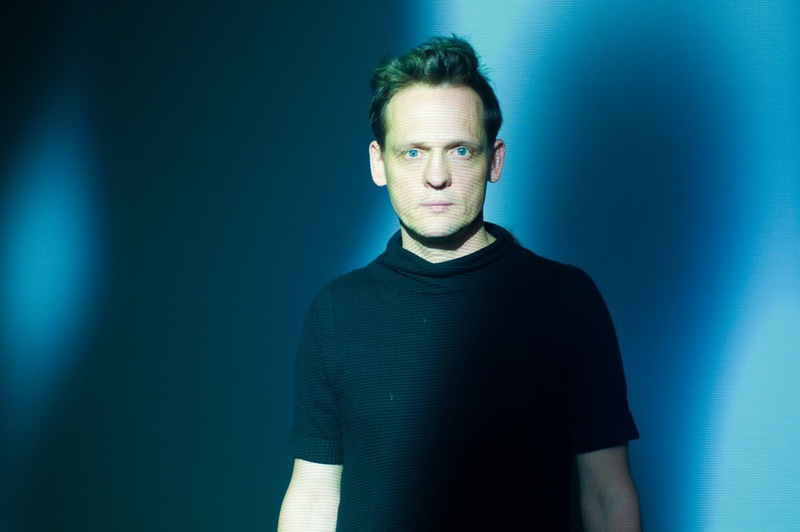 As a musician and co-founder of the legendary Raster-Noton label, Alva Noto’s unmistakable brand of glitchy and futuristic groove has also left a lasting mark on both minimal techno and electronic music’s more experimental sub-genres. Unsurprisingly, the artist seems as at home remixing Björk (via Timbaland) as he is collaborating with Ryuichi Sakamoto or Blixa Bargeld. Curator Hans Ulrich Obrist met Nicolai in his Berlin studio to find out more about the sounds of science, understanding the elegance of machines, and what it meant for a generation of artists from the former East Germany to come of age while the world of their youth disappeared. Yes, it will explode, but it will do so in a controlled fashion. Here’s what you’re looking at: the flame is being sent through two glass pipes which are filled with propane gas. Due to the ratio of gas to oxygen, the flame increases in speed and, eventually, causes a rapid explosion when it has accelerated faster than the speed of sound, which is 334 meters per second. I’m creating a sonic boom—you’re looking at a sonic boom machine. Have you ever exhibited this piece? It’s the same process as with an inventor. Some works are just never really completed, but instead are constantly being reworked and augmented. I think that’s often a result of being confronted with new conditions for presenting a piece—having to use new materials or a different space. And after an explosion the installation is, what, charging? Have you timed how long it takes for the installation to charge before it can produce the sonic boom? It takes around four minutes for the tubes to be filled up with gas, and then the explosion itself … well, you’ll see. It’ll happen any moment now. Wow, that’s incredible, just incredible. And it’s over now? Yes, but it can be rigged to charge back up and happen over and over again, continuously, on its own. A cycle, so to speak. You got it. It operates itself, as long as there’s enough gas. I can’t imagine a better way to begin an interview than with an experiment. I see you have lots of books here. Some—that’s my library I tend to look at regularly. Downstairs in the studio is my research and record archive. The books I’ve amassed over the last twenty years or so: I have a small section for architecture, architectural theory, design, visual arts, photography, books on Japan, a science section, and then a couple of shelves of music history and theory. It’s all material I tend to work with on a regular basis. My archive and library aren’t nearly as organized. [Pointing to a print] Is this a Beckmann? Yeah, it’s an original Max Beckmann. A friend of mine was actually responsible for doing some of the reprints and he gave me one as a gift—I guess you could call it a bootleg. You don’t hang so much stuff on your walls. I need my walls empty to be able to work. When there’s too much happening around me, I can’t think. By the way, I’ve prepared some videos for the interview I’d like to show you. Excellent, that’ll allow us to delve deeper into conversation. This is a short film on the syn chron installation I did in the Neue Nationalgalerie here in Berlin in 2005. It’s a piece that reacts to the location it’s exhibited in, and the fact that the Neue Nationalgalerie has glass walls on all sides allowed for it to be perceived differently depending on the time of day. It essentially consists of an automated forty-two minute cycle of light and sound, which is projected onto the skin-like surface of a crystal-shaped architectural body—the whole thing is certainly more impressive when it’s dark outside. At night, when the museum was closed, the installation reacted to movement and activity outside the museum by means of a microphone trigger attached to the glass window. What you’re seeing here is a white laser, which was a special prototype produced by a company from Jena. It was pretty exciting to be able to use laser technology that very few people have access to. You might call it laser-architecture. Well, it’s more of an architectural body that becomes an interface of light and sound. It’s a space that’s defined by its surface. Your workspace here feels sort of like a recording studio. It’s important for me to be able to separate the different aspects of my work, to create some physical borders between the label, my music, the publishing company and art—even if they’re occasionally combined in a sort of multi-media amalgamation like with what I just showed you. This part of your studio in particular feels very hermetic and closed off. This where I can really be alone. I have no telephone, little connection to the outside world and almost no distractions. [pointing at studio monitors] These speakers look and sound incredible. These are really special speakers produced by a small electronics company from Saxony, who had been making studio monitors even back in the GDR. What’s really amazing about them is that the tweeter, which is responsible for the mid and high range frequencies, is located in the middle of the subwoofer, which produces all of the lower midrange and bass sound. Essentially, all frequencies are then projected on the same axis, creating this incredible sonic transparency; you can hear everything with amazing precision. That’s why I use them as my reference monitors—to be able to really hone in on the sounds I create. I use another pair of the same speakers for installations as well. In terms of function, they’re completely indispensible for what I do. They usually come with wood paneling, but I’ve had them modified. I treat them like sculptures, actually. For one installation in particular, I’m only able to use this specific kind of speaker. In the piece Invertone I experiment with what’s known as “phasing”. It involves a continuous noise emitted from two speakers at inverted wavelengths. The result is that the sounds cancel each other out in the middle of the room, creating an immaterial membrane. In theory, that produces at least one point of completely dead space with no sound at all. I’m particularly interested in the idea of people moving around to find the point where the sound stops. I think it’s interesting that the technology you use in your installations is all produced in what was formerly East Germany—lasers from Jena, studio monitors from a small town in Saxony … it seems to correspond to a spirit of inventiveness and productivity that’s often associated with the GDR. Chemnitz, where I grew up, is—or should I say was—known mostly for textile production. It was a real industrial city, and I think it’s had a really strong influence on me as an artist and musician. Sort of like Ada Lovelace and the analytical engine? And that reminds you of your childhood? Yes, and early adulthood. I remember sometime after re-unification, I wandered into one of those defunct factories and happened upon a massive collection of cartridge paper. There I found these remarkable patterns drawn onto this really thick paper. These were beautiful, sometimes simple, sometimes highly complex weaving patterns. Yes, there are more than one thousand drawings that I have in my archive. I’m still waiting to incorporate them into my work in the future—it’s sort of like a sketch pad, in a way. I can imagine making a book out of them. It’s such a huge collection! And what are the drawings like? Are they geometric? Yes, very geometric and very beautiful. The industrial weaving machines produced these great abstract motifs—sometimes just huge ovals or other really simple forms. And because they were made bigger, they ended up looking like ornaments. And you’ve always had them with you? Yeah, I always have one or two lying around in the studio downstairs. And when are they from? The drawings themselves were done in the sixties, but I found them in the early nineties. For me it invokes the history of the digital. Sure, it’s the history of ones and zeros. But to come back to Chemnitz and Jena: Historically, there’s a huge concentration of patents that were registered in the area, which was the result of industrialization and the importance placed on technological advancement. I mean, in 1923 Chemnitz had the largest streetcar railway system in all of Europe, as well as the largest indoor swimming pool. It truly was the city of inventions and innovations. So you grew up in an especially inventive atmosphere. When was the first time you went to a museum? I remember going to the Chemnitz City Museum when I was a small child. I also recall that growing up, the most influential artist for lots of people around town was Karl Schmidt-Rottluff. I grew up near Rottluff’s birth house and some of his family still lived in the area near the old mill. I think the house is supposed to be turned into a museum. And what about other influences when you were young? I remember being particularly impressed by the hands of Rodin sculptures, as well as by Bauhaus. I lived on the same street as the big Pölzig factory, and across the street was this incredible villa that I only realized years later had been built by Henry van de Velde. It seems like the twenties were culturally and financially the most prosperous times for Chemnitz, is that right? Yeah, that’s when Chemnitz grew the most, together with the industrialization. People called it the Manchester of Saxony. But I remember that whenever there was an official visit from a foreign president or when the city hosted any official event for foreign visitors, everything was fixed and renovated, at least superficially. It all became one big Potemkin village. That happened all over East Germany, really. I conducted an interview with Ai Weiwei not too long ago and he told me that when the Olympics were held in Beijing, the government repainted entire parts of the city at night while everybody was sleeping. It also happened to Ai’s mother’s house—which he then took to repainting in the original colors. When you mentioned Manchester before, I had to think of music. What was the music scene like in Chemnitz? Well, there wasn’t any state-sponsored music academy and you couldn’t study it at university … But when I was growing up, the city was a real meeting place for autodidacts and creative types, plenty of “genius dilettantes”; basically artists and musicians who didn’t care about reading notes or classical training. The local band AG Geige was maybe the best example—they really represented the avant-garde even though they were on a label … which was pretty rare for anything that strange coming from East Germany. I actually co-run the Raster-Noton label with two of the band’s former members, Frank Bretschneider and Olaf Bender. AG Geige was probably the first multi-media project that I was aware of, which is pretty important if you consider the nature of my work. Back then, most of the bands in the area were playing punk. But eventually you ended up in Leipzig, right? My brother was living there, and at the time, there were very few alternative exhibition spaces, and next to none where people who never formally studied art could show. Leipzig was an incredibly exciting place to be—almost more exciting than Berlin in some ways. There wasn’t the same sort of subcultural phobia that there´was in Berlin, no extreme fear of the fringe on the part of the authorities. In terms of freedom, it just seemed like more was possible. Talking about the past from the vantage point of the present reminds me of a piece you’ve been working on for years now, called Future Past Perfect. This is a long-term film project and screenplay composed of single scenes shot one at a time, one each year. Conceptually speaking, each film is composed independently without any explicit connection between them. Ultimately, I’m interested in what kind of larger picture these films produce when I actually do put them together; what kind of story gets told when you have no consciously overarching narrative. It seems like you expect something to be revealed. What do you think the larger picture will be? I think it’ll only be possible to know when it’s done. It’s a bit like building a sculpture without having access to it in its entirety. That reminds me of Borges’ description of a collection of disparate pieces of his own work as a form of self-portrait, like in Dreamtigers. I think there’s lots of truth in that idea. I’m fascinated by the idea of pieces that are made over a really long period of time. I originally studied landscape architecture and the things I learned how to design were never things I would end up getting to see to completion. As a landscape architect, when you’re designing parks or gardens with special tree arrangements, you never actually get to see the finished product. The park and garden craze of the nineteenth century in Germany, for example, only really grew into maturity and reached its true manifestation in the thirties, interestingly enough. You have to be able to think and design beyond the limits of your own lifespan. Have you ever designed a park or garden like that? I’ve designed plenty of things as a student but was only involved in the realization of one project, a so-called tree pyramid, where one tree is planted on top of a grassy, pyramid- shaped hill and then other trees are successively planted around it. Eventually the pyramid gets bigger and bigger while at the same time actually growing inwards. And that got built—or rather, planted? Yes, on the grounds of an old castle in Mecklenburg, not too far from Berlin. Let’s talk about your new album Univrs for a moment. The music is simply remarkable; the level of precision involved in crafting the individual sounds and arranging the rhythms is astounding. There’s something unrelentingly futuristic about what you do, and even though the blips and noises you use are unconventional, the tracks still manage to groove so heavily. The album is the follow-up to my Transall series, along with Transform, Transvision, Transspray, and Transrapid. It was released in late October this year. One of the basic ideas behind my identity as a musician and producer under the pseudonym Alva Noto is the concept of transformation. I wanted to take the sounds and the scientific knowledge behind audio experiments and combine it with more popular creative musical impulses and rhythms. Essentially, I’m interested in adapting sounds that aren’t just avant-garde but rather exclusively science-related to the popular context. I think combining what I do as a visual artist with what I do as a producer allows me to dig deeper in dealing with technological transformation. It’s a common theme in my work to infuse things, particularly machines, with creative functions they otherwise wouldn’t have … Like turning a television into a generator of creative output instead of a mere receiver and transmitter of predetermined content and information. It seems like a fundamental desire for us to want inanimate objects to spring to life. Or rather: for robotically animate objects to regulate their own functions. Photo 1: Carsten Nicolai, photographed by Sebastian Meyer in Tokyo. Photo 2: Carsten Nicolai, syn chron, 2005. Interior view of installation at Neue Nationalgalerie, Berlin, Germany.